If I had the need for a bar stool, which I do not, if I even liked bar stools, which, unless they are in a bar, I really don't and if I had $1,400 in the budget, which is never going to happen, this warm, handcrafted, uniquely modern Tractor Bar Stool is the one I would buy. 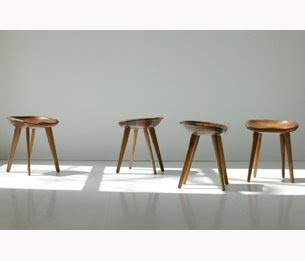 Designed by BassamFellows as part of their Craftsman Modern collection I love everything about it: the ergonomic solid walnut seat, inspired by a Swiss tractor seat; the leather wrapped footrest; the mid-century feel of the tapered legs. I want to look at every day; to touch it; to sit it on it, elbow resting on the counter, one foot resting gently on that leather bar. Despite the seductiveness of the image I just painted, practically I have no use for a bar stool but fortunately The Tractor Stool also comes in a regular height model ($1350). That would be better suited to our needs; it's just the thing to add to the table when extra guests turn up unexpectedly and would look gorgeous in The Cool House, or any modern, or Craftsman, interior. The Craftsman Modern Collection, which includes tables, credenzas and a deceptively simple daybed, is available from The Conran Shop. 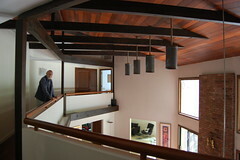 You can see more of BassamFellows' furniture in a New York Times slideshow of their Philip Johnson designed house. That's a nice collection. And correspondingly pricey. If I had that daybed, guests would want to tell me all about Mummy and Daddy, and I'd have to charge them accordingly to pay for the furniture. I love walnut. 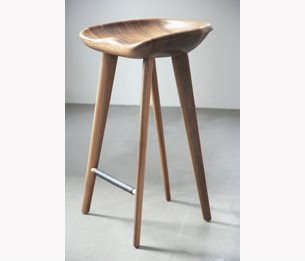 And it's good to know that I'm not th only one who enjoys touching wood :-) This stool looks like it would feel SO good! !